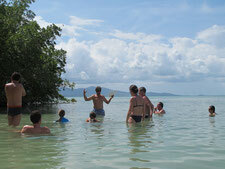 A unique tour offered by Guadeloupe Evasion Découverte. Nature does not belong to us, we belong to nature. Discover our nature by protecting it. Rich discovery tour and information on the Grand Cul de Sac marine, ecosystems, its biodiversity, mangrove, wildlife and flora, marine turtles, the Lamentin and some history of American Indians that once inhabited KARUKERA. Get on board " TAONABA " our solar electric ship and discover playful way the fauna and flora of the Grand Cul de Sac Marin, its hamlets and its marine reserve. 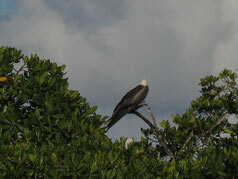 Enjoy the silence to observe wildlife without disturbing it. 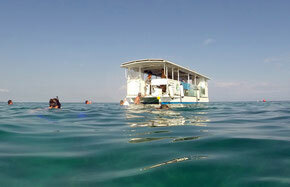 Visit first the coral reef where you can make snorkeling. Stop on the Caret island, typical small islet of coral sand and coconut where you can snorkel or stay on the beach for lazing about. 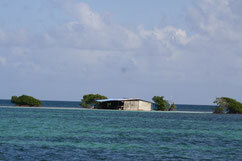 Departure for Fajou , a small islet located in the heart of the marine reserve where wait for you its wild vegetation, red and black mangroves and protected wildlife. This islet of over 140 hectares is a place completely preserved. It is also a nesting ground for sea turtles, habitat of pelicans that nest there and hunt there, the nursery of small lemon sharks and hundreds of sea star and many other species. 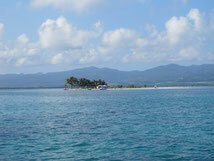 You will enjoy this unique place where our ship is authorized by the National Parc of Guadeloupe. 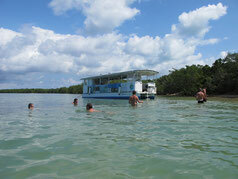 You will be alone near a small beach surrounded by red and black mangroves and this wilderness will delight you. 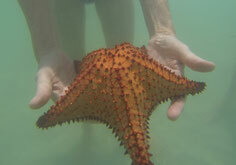 You will enjoy swimming, discovering sea stars while snorkeling or lazing on a small deserted beach. After an aperitif, a delicious Creole meal is served and then you go for a fun and educational excursion to discover how the mangrove can live in a saline environment, how it can reproduce itself and how the mangrove was formed. Oysters, mangrove crabs and sea cucumbers are at the rendez-vous. After a small tour to observe and take pictures of pelicans chasing, We will move to other islets also located in the marine reserve. A first stop to the Carénage îlets to observe an islet entirely of red mangrove bathing in salt water and then a second stop to visit the îlet Blanc born during the passage of the cyclone Hugo in September 1989 and the Bids Island where nest egrets, herons, frigate birds and pelicans . AUTORISATION D’EXPLOITATION COMMERCIALE DANS LES AIRES MARINES PROTÉGÉES DÉLIVRÉE LE 9 DÉCEMBRE 2014 PAR LE PARC NATIONAL DE LA GUADELOUPE.